I am re-posting this on the anniversary of a car crash that would claim the life of Holocaust survivor and later U.S. Army Ranger, Steve Barry. Steve passed away yesterday, January 16th, 2012, after a long and difficult ordeal from injuries sustained in an automobile accident in September. I’ll always remember his special Christmas and Easter cards that he sent to me, made personally on his computer; his funny, self depreciating humor; and above all his overwhelming happiness at being able to finally meet the men who saved him. 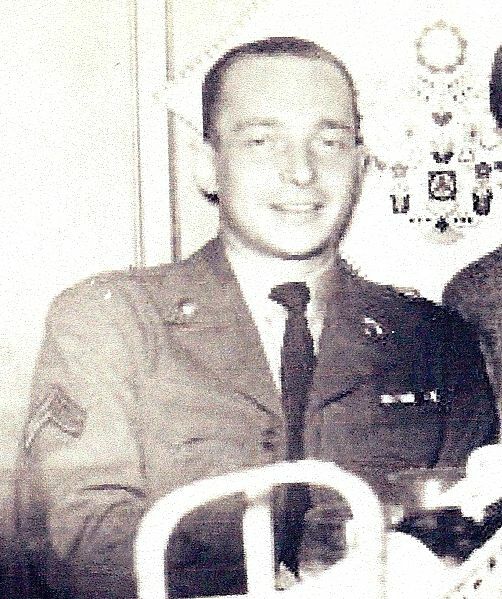 I hope that the memories sustain his wife Stella and his children and their families, and also the friends that he made later in life and became soulmates with- soldiers Carrol Walsh and Frank Towers, the soldiers who arrived on the scene to free him and help him begin his life anew. 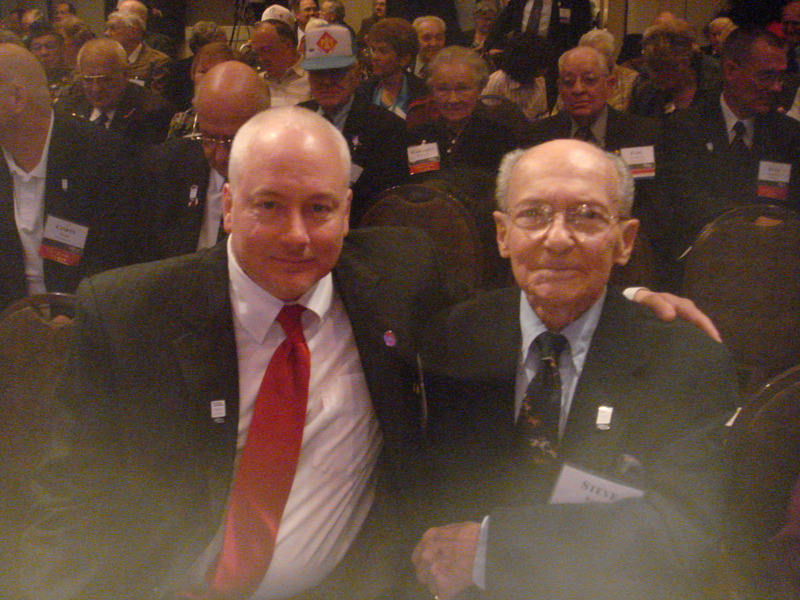 Matthew Rozell, Stephen Barry, National DOR Ceremony, Washington, DC April 2010. 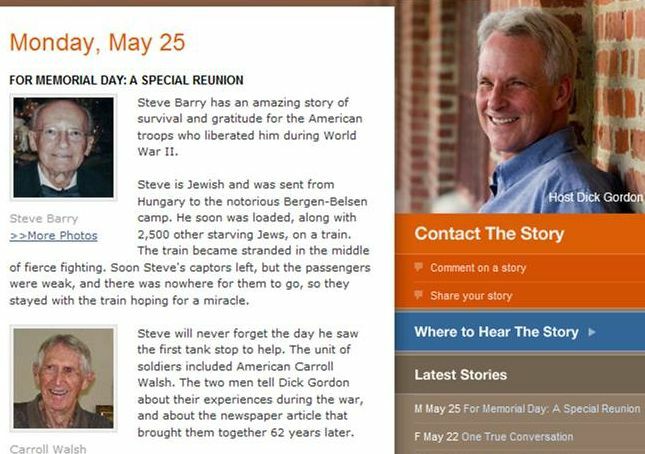 This photo was taken the day after the 65th anniversary of Steve’s liberation in April 1945. We had just been honored by the director of the United States Holocaust Memorial Museum before the national ceremony in the Capitol Rotunda. I will leave you with a few of his words-and we will remember. Thanks, Steve, for all that you gave us, and for passing the torch to a new generation of students to carry your message forth. And the educational films I constructed from them. Stephen B. Barry, 87, of Boca Raton, Florida, passed away peacefully on January 16, 2012 following a serious car accident in late September 2011. A Holocaust survivor,who was proud to be an American, he went on to live the American dream. He is survived by his wife Stella of nearly 58 years, his children Barbara (Paul), Jamie (Jerry) and Randy and his beloved granddaughters, Amanda and Victoria and many extended family and friends. Services to be held at Beth Israel Memorial Chapel in Delray. In lieu of flowers, the family requests contributions in his memory be made to The United States Holocaust Museum. God bless Steve and his family! I first met Steve at 30th Inf. Reunion. Several years back and then at Hudson Falls HS. He was such an inspiration and a excellent role model of succeeding with life – no matter what the odds. I will miss him, as well as the world his legacy will live on forever! I cried when I saw the photos. What I saw was hope love and freedom. I will never process all of that horror. How could they have treated life that way. Never forget, never forget. Thank you for the history lesson.